Payne earned his third OVC Player of the Week honor of the season after scoring 22 points and dishing out seven assists in Murray State’s 83-71 road victory over Southern Illinois. It marked the Racers seventh-straight victory overall and was the first in Carbondale since 1990 (breaking a four-game skid at SIU). Payne was 6-of-13 from the field, including three 3-pointers, and was a perfect 7-of-7 at the charity stripe. In addition to his seven assists he had two steals and a rebound. 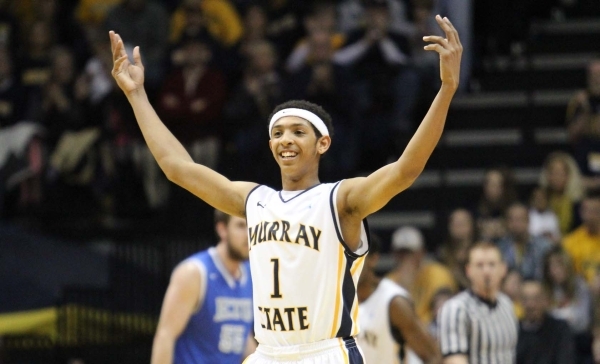 Payne currently ranks second in the OVC in scoring (19.1 points/game), assists (5.6/game) and steals (2.6/game). Others Nominated: Luke Piotrowski, Eastern Illinois; D.J. Felder, Jacksonville State; Josiah Moore, Tennessee Tech. Joseph, a transfer from Monroe College, had season bests with 12 points and seven rebounds in UT Martin’s road game at Butler last week. The junior also played a season-high 32 minutes in hitting 5-of-8 (62.5%) field goals and also adding a blocked shot for the Skyhawks. Others Nominated: Trae Anderson, Eastern Illinois; Denzel Richardson, Eastern Kentucky; Justin Seymour, Murray State; Jake Newton, Jr., SIUE; Torrance Rowe, Tennessee Tech. Jugovic had 11 points and a season-high six assists as Tennessee Tech went to UMKC and won 81-60, marking its largest non-conference road win since 1982. Jugovic came off the bench to hit 3-of-7 field goals and 4-of-4 free throws in 27 minutes of action. In addition to his six assists he also added three rebounds and a steal. Morehead State at Central Arkansas, 7:00 p.m.
Tennessee State at TCU, 7:00 p.m.
Eastern Kentucky at Coppin State, 12:00 p.m.